Transformers: Revenge Of The Fallen Ransack! Not too long ago, there was hint of a green Transformer with a flying alt mode, could this be it? 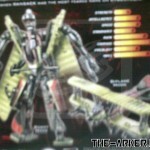 New images of scout sizeclass Ransack have emerged. Perhaps this Transformer is based on a plane found in the Smithsonian museum, the same place that the SR-71 Blackbird which Jetfire scans is in too! Discuss on the Toyark Forums› Views: 3123 › Credit: S250 of the Toyark Forums!